Amazon has a good deal on Mario Power Tennis. 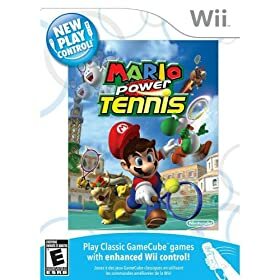 Power Tennis incorporates multiple characters, themes, and locations from the Mario series. The game includes standard tennis matches, but contains variants that feature different scoring formats and objectives. Other variants include "Gimmick" courts, thematic areas with components and properties that directly affect gameplay. The game consists of 18 playable characters, each categorised by their style of play and each with a pair of unique moves known as "Power Shots". Power Tennis was developed simultaneously with Mario Golf: Toadstool Tour, and the pair shared similar technology and concepts with each other during production. Such similarities include an emphasis on the Mario theme in characters and settings as well as alternative game modes such as "Ring Shot". The game was positively received in general, attaining an aggregate score of 81 percent from Game Rankings and 80 percent from Metacritic. Critics praised the game's depth and variety, but criticised the Power Shot animations, which could not be skipped.